I have an AE44 USA made Monterey model from the early 80s I beleive. Had it for years, and used it on hundreds of gigs. It is beat to heck, and still plays like a dream. I ust recently found a dead match 12 string, same body size, binding, burst, fret markers, looks like it was made from the same piece of wood! It is a wonderful 12, low action, good intonation, excellent string spacing, and LOUD for a thin body due to the arched back. I'd post a picture, but not sure how to do it on this site. Anyway, I own Gibsons, and an old Taylor, and still prefer the Washburn Monterey. Not a lot of info out there, but I see pictures of Dylan and George Harrison. IMHO these are special guitars. Any brothers or sisters out there who want to share the love? I'm looking for another Monterey 12 for my Mom (70 and still pickin') . She tried to steal mine the other night, and I think if I can't find one by Thanksgiving she's going to leave with mine. Nice looking guitars. Does it say it's made in USA? When Washburn was started again, they had the guitars made in Japan. the production was moved to Korea in the early 90's Your guitar is probably Japanese. They made some nice guitars. I had an 80's Woodstock. 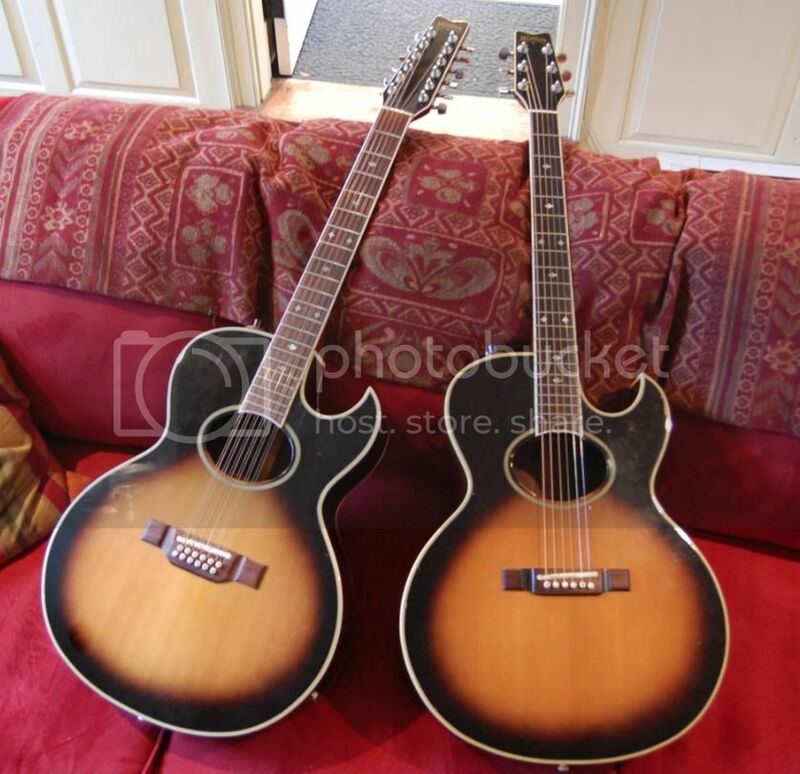 Love this pair of guitars....just wish they were in my music room!! Welcome Monterey84! Nice pair, both were made in Japan. What are the serial #'s? Should be a 5 digit # starting with an 8 or 9. Also, what do they say on the inside? Monterey or EA-44? Monterey 12's show up every now and then, but you might also find another 12 string Festival, like a Woodstock, or an EA-20/30 for your Mom. spot on gtracer! The serial number on the 6 is 87655 and the 12 is 88067. Thanks for all the help, so what years are my guitars? Great forum, great, great guitars! I love my guitars even more now that I know they are MIJ like the best strats of the era! Early 80's. Glad to know that the 12 from El Paso went to a good home. Enjoy! haha, you know it! I've owned and played dozen's of 12s over the years. For me, the Monterey is the best of them. It plays and stays perfectly in tune...I don't get it, really. Add a super low action, well defined string spacing and as my wife said last night as we were playing Christmas songs (2000 Miles) that guitar is too loud ...and it's a thinline! I'm looking for another one if anyone out there is selling.